The company Grena, Inc., was the first in the Czech republic to start the manufacture of refractory, insulation and non-combustible materials made of vermiculite. The materials which are mainly used in the industry for insulation of heat installation are expanded heat-insulating fire-resistant materials which are easily machined, are highly insulating, are thermal shock resistant and highly imperishable. These materials include the boards made from vermiculite. 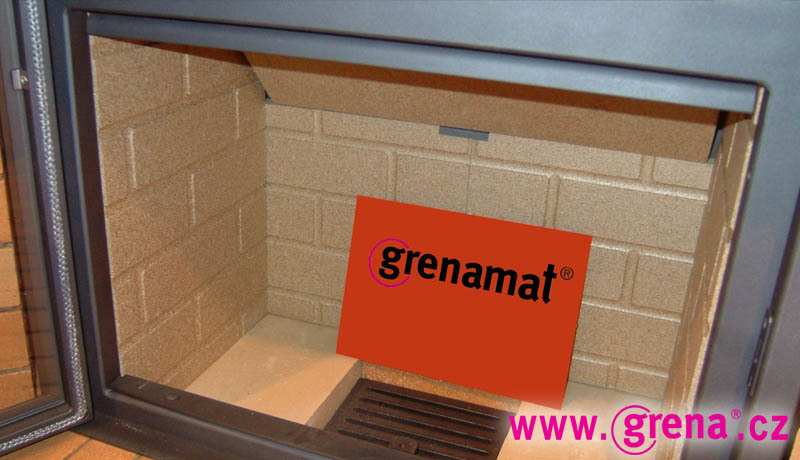 Grenaisol is a construction an insulation board with a low density of 430 kg/m3 that can be used not only as wall insulation behind a heat source but also as a building & structural element to build the fireplace enclosure without any other additional supporting structures.Grenaisol board is sufficiently firm to ensure the necessary fireplace enclosure rigidity and durability and, at the same time, it has excellent insulating properties with a low thickness (30 - 50 mm). Grenaisol boards can be used not only as a healthy material for easy construction of your fireplace shell or insulation chambers of a tiled stove but at the same time, they help to ensure sufficient insulation, and all-in one step!! Grenatherm is a construction and heat radiant board made of expanded vermiculite and a special inorganic binder in density 750 kg/m3 which ensure high resistance against thermal shocks and at the same time the required radiant property.The properties of Grenatherm 750 are transmission of wholesome radiation heat, high strenght and easy treatment by standard manual wood-working tools. 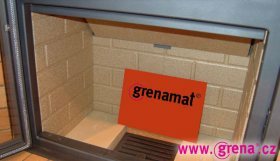 The Grenatherm board allows you to build a reliable heat radiant fireplace enclosure easily and economically within one day which was not possible until recently. 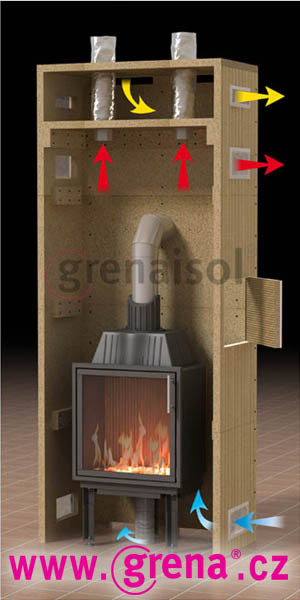 Grenalight is a high inuslating and non-structural board designed for the highest quality of insulation for fire-places, stoves, cookers and other heaters. The board Grenalight is very light (density 350 kg/m3) and at the same time firm. It is made of 100% of natural materials, and therefore it is completely harmless to health. Grenalight is recommended to use toether with Grenaisol boards and with Grenathem boards. The board Grenalight can be used for non-bearing and non-structural parts of fireplace surrounds. new construction of heating devices requires higher temperature of combustion and thus reduction of emissions. Nowadays producers are not satisfied only with wood ´burning´but they use hot gas with a multiple grade of combustion (2 or 3 times) which leads to higher temperatures of combustion, lower emissions and obviously to fuel savings. These constructions prefer vermiculite boards which enable higher temperatures of combustion without a risk of damaging of heating device or furnace. vermiculite boards are light, density 400 – 900 kg/m3 and it leads to delivery savings in comparison with refractory concrete or fire-clay. vermiculite boards can be machined by common wood-working tools so it is possible to change them or adjust them without any necessity to make special forms for products. vermiculite is basically an expanded mineral which is ecological, does not represent any health hazard and does not release any vapours even at high temperatures. For these properties vermiculite is more and more often preferred to high volume materials which are heavy with a difficult technique of machining.